If you have any questions about the PRINCE ABDULAZIZ information page below please contact us. 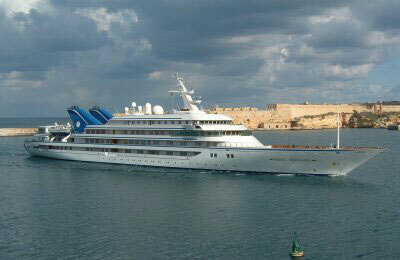 The enormous superyacht PRINCE ABDULAZIZ is a motor yacht. This 147 metre (482 ft) luxury yacht was crafted at Helsingor Skibsvaerft & Maskinfabrik A/S in 1984. PRINCE ABDULAZIZ was formerly named Abdul Aziz. Superyacht PRINCE ABDULAZIZ is a elegant yacht that is able to sleep up to 64 passengers on board and has approximately 65 crew members. 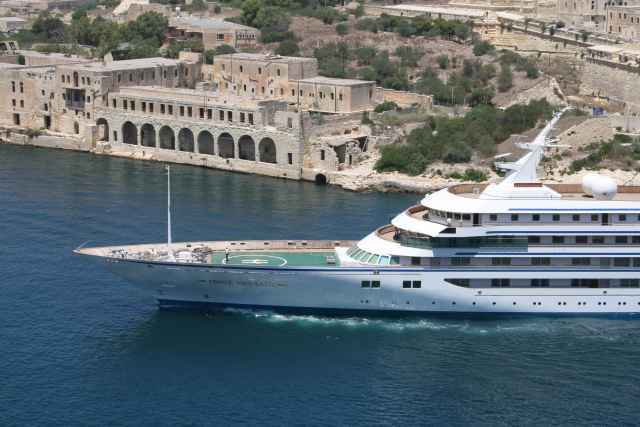 An exciting feature of this luxurious motor yacht is her helipad. The private superyacht was designed with a naval architect called Maierform. David Hicks produced her interior design brief. 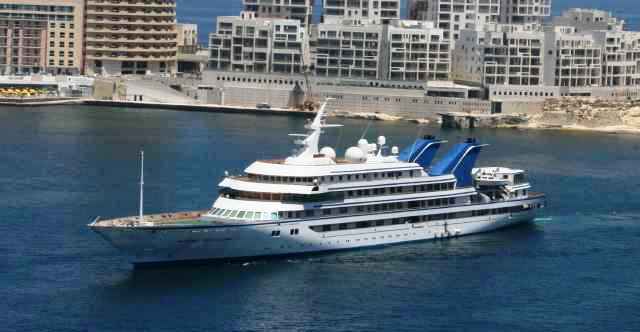 Prince Abdulaziz is one of the Royal yachts of the Saudi Royal Family and is one of the largest motor yachts in the world. 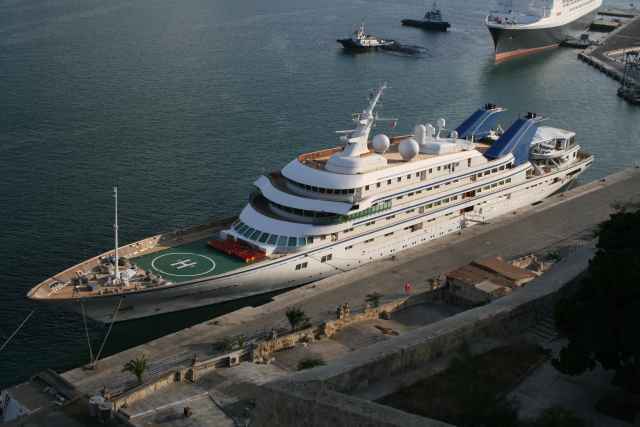 The yacht has been used by King Abdullah of Saudi Arabia to conduct official business aboard however is also been used for leisure and relaxation. It took 15 months just to complete the interior of this massive yacht which was the largest and most expensive yacht when built. The large lobby on the yachts main deck was designed to mimic that of the Titanic, with large spaces and classical furniture. Another unique feature of the yacht is her huge bow with a helicopter pad. The yacht's general design work came from Maierform. The formal naval architecture intellectual property are a creation of Maierform. Motor Yacht PRINCE ABDULAZIZ received her stylish interior designing from the interior design office of David Hicks. Created by Helsingor Skibsvaerft & Maskinfabrik A/S the yacht was constructed in the known yacht building country Denmark. She was successfully launched in Helsingor in 1984 before being handed over to the owner. A huge area is manifested with a maximum beam (width) of 18.3 metres / 60 ft. With a 4.88m (16ft) draught (maximum depth) she is fairly deep. The material steel was used in the building of the hull of the motor yacht. Her superstructure over the hull is fashioned out of steel. In 2005 further refitting and modernisation was also finished. She posseses twin mightly SEMT-PIELSTICK main engine(s) and can drive at a rousing maximum limit speed at 22 knots. The engine of the yacht produces 7800 horse power (or PRINCE ABDULAZIZ kilowatts). Her total HP is 15600 HP and her total Kilowatts are 11479. She is driven by twin screw propellers. As for the yacht’s stabalisers she uses Vickers. 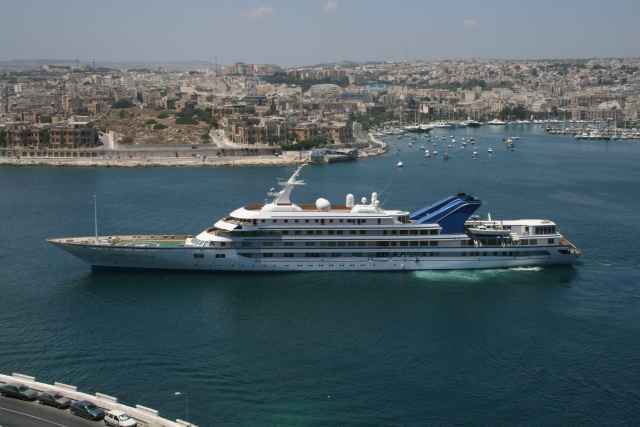 PRINCE ABDULAZIZ has a/an vivacious cruise speed is 18 knots which gives a range of 5000. 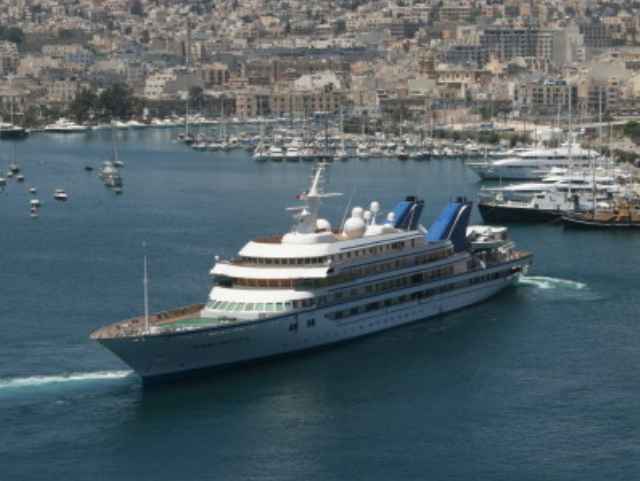 The huge luxury yacht M/Y PRINCE ABDULAZIZ is able to accommodate a total of 64 people and has 65 professional crew. 147 metres / 482.3 feet. Giving the combined power of 15600 HP /11479 KW. 5000 at a speed of 18 knots. Around October 2009 PRINCE ABDULAZIZ visited Vólos, in Greece. 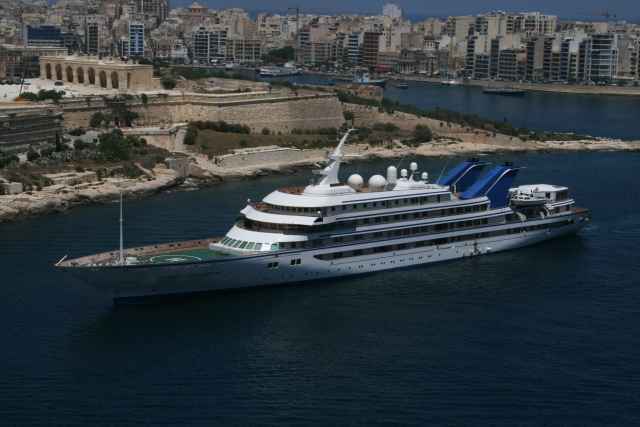 This motor yacht has navigated the cruising ground around Magnisía during the month of Sept 2009. As she has a heli-pad area on deck this provides extra transport for PRINCE ABDULAZIZ. PRINCE ABDULAZIZ features a teak deck. The luxury yacht PRINCE ABDULAZIZ displayed on this page is merely informational and she is not necessarily available for yacht charter or for sale, nor is she represented or marketed in anyway by CharterWorld. This web page and the superyacht information contained herein is not contractual. All yacht specifications and informations are displayed in good faith but CharterWorld does not warrant or assume any legal liability or responsibility for the current accuracy, completeness, validity, or usefulness of any superyacht information and/or images displayed. All boat information is subject to change without prior notice and may not be current.